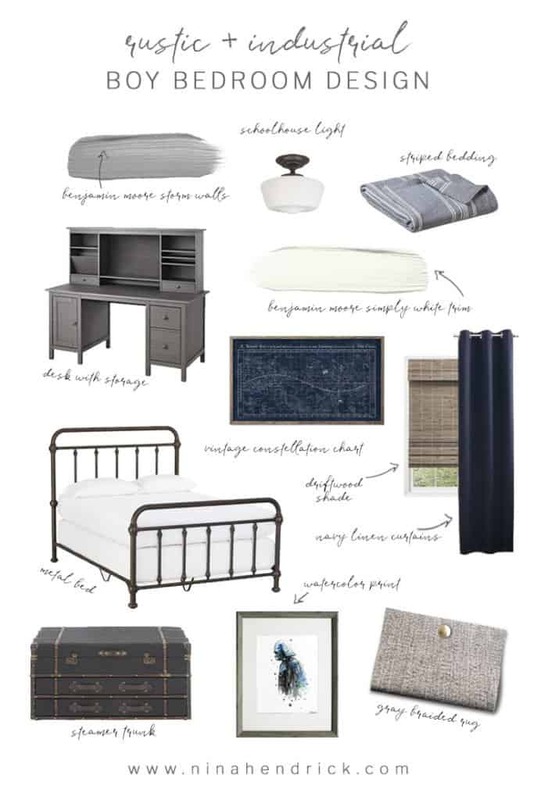 Rustic Industrial Boy Bedroom Design | Gather inspiration from this Mood Board for a Rustic Industrial Boy Bedroom Design from Nina Hendrick Design Co. 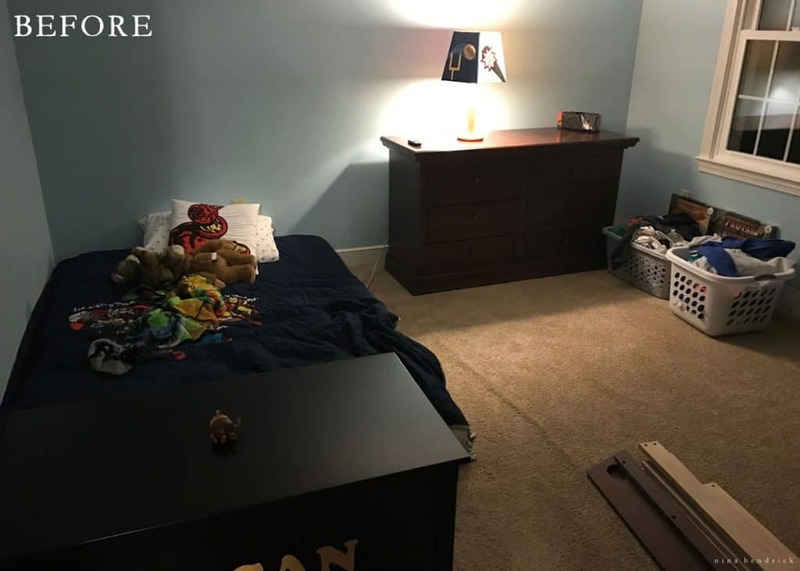 Whether I’m ready for it or not, our oldest son Logan is no longer a “little boy” at nine years old and wants a much more mature look for his new room. He’s an old soul, an introvert, and I know he will definitely treasure his own space as time goes on. If you’ve followed along with our renovation, you may know that we’ve mostly focused on the first floor of our home for the past five years. It’s nearing completion, so we’ve started on the upstairs. We are actually hiring out some parts of the various rooms, not because we can’t do them, but because it enables things to move a lot quicker than we can possibly do them. While we have tried to tackle things like flooring, trim, and painting ourselves in the past, we recently hired out carpet replacement, trim and door replacement, and help with painting for the upstairs rooms. As a result, we’re coming up quickly on the “fun part” for several upstairs rooms- the decor! I thought I would catch you up on my plans for all of the rooms in our home in the coming weeks. While I’ve shared mood boards in the past, I wanted to give them all an update and a cohesive look. I also know that a lot of you have joined us later in the renovation, so it’s a good way to catch you up on the current status of all of the rooms! Plus, who doesn’t love mood boards? Logan hasn’t had new furniture since he was a baby, and in fact was previously using his convertible crib as a bed (Before it broke- the photo above shows the slats right after it fell to the ground and we disassembled it. Yikes! ) and his changing table as a dresser. It had worked well for tiny baby clothes, but we realized the drawers were strangely shallow after his clothes became a bit bigger. I talked to him a lot about what he wanted for his room. I feel very strongly that it’s important for a person- whether it’s an adult or child- to have a space that is their own style. While I was prepared to give him creative freedom (within reason, obviously), our apple hasn’t fallen far from the tree anyway. 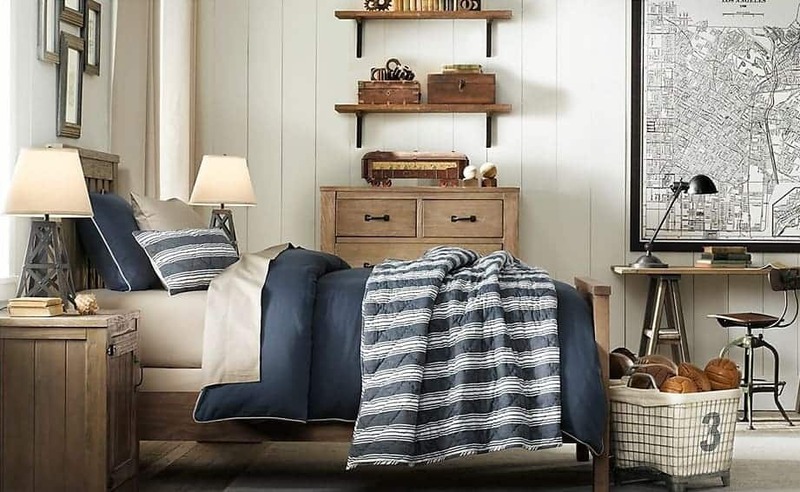 He suggested materials like rustic wood, metal, and chose gray and navy blue for the colors. He asked if we could also incorporate some of his favorite things- Minecraft, Star Wars, and Marvel superheroes- which I was more than happy to do. He has been fine with telling me when he doesn’t like things, such as the original bedding I chose, and I’ve made some returns. He’s skeptical about the comfort level of the chair in the mood board, so I’m searching for something that will work instead. His highest priority was a desk that he can work at- he dreams of being an engineer someday, and he wanted a place where he can sketch ideas and tinker. It has been a fun project to work on and so interesting to see his personal style and independence emerge. 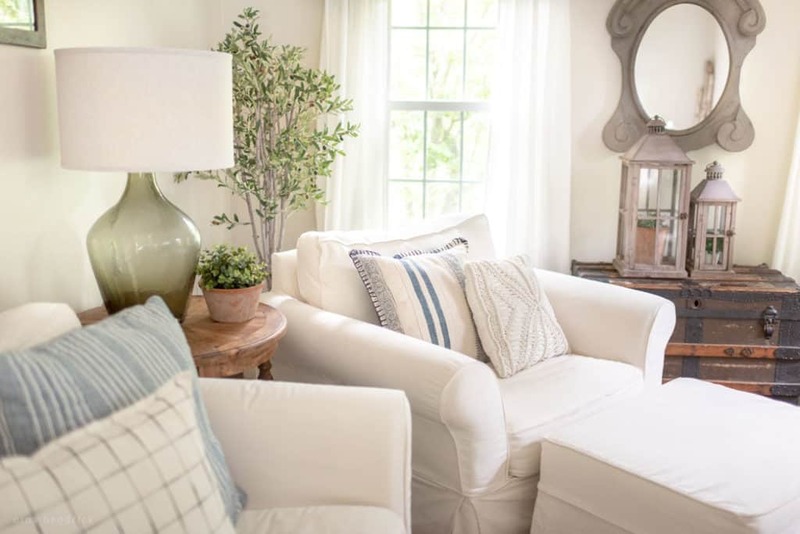 The result is something that coordinates with the rest of the house, but is still very uniquely “Logan”. Right now we’ve got the carpet replaced, one coat of Gray Owl paint up (see our whole house color scheme here! ), and some of the trim replaced and painted. We’re waiting on his closet doors and bedroom door (it was damaged in transit, so it’s a bit behind schedule). I’ve started to gather some of the decor for his room. We’re planning on assembling his desk tonight, but we still need to get the chair and bureau. Some of his art and bedding is already here, some is on the way, and I have to print some of the art out from Etsy. 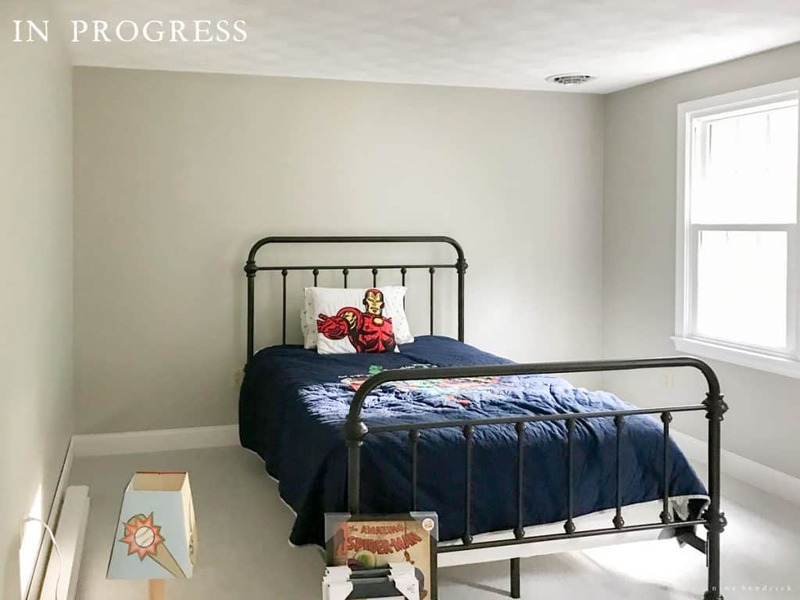 Unfortunately, there was no possible way to arrange his room other than having his bed tucked in the corner, so the placement in this progress photo is temporary. It isn’t my favorite arrangement, but he’s happy to have more floor space for activities. The ceiling is one thing we don’t have a firm plan for yet. It definitely needs a light fixture- none of the upstairs bedrooms had them. As far as the finish goes- if you have been here for any length of time, you know that I strongly dislike the scalloped textured ceilings. It’s plaster, so it can’t be wetted and scraped like “popcorn” ceilings. We have done beadboard and tongue-and-groove over the texture in other rooms and we’ve talked about adding a layer of thin, smooth drywall. One idea I had for this room was stick-on barn wood, but Mack is worried it wouldn’t stick to the texture neatly. So the ceiling is TBD, and may very well end up being just a fresh coat of paint for phase one. Although the beautifully styled catalog bedrooms above inspired my plan, we have always been really impressed with IKEA’s affordable HEMNES line as an alternative. It’s solid wood and they’ve introduced this gray finish, so we can get a quality piece for a lot less! 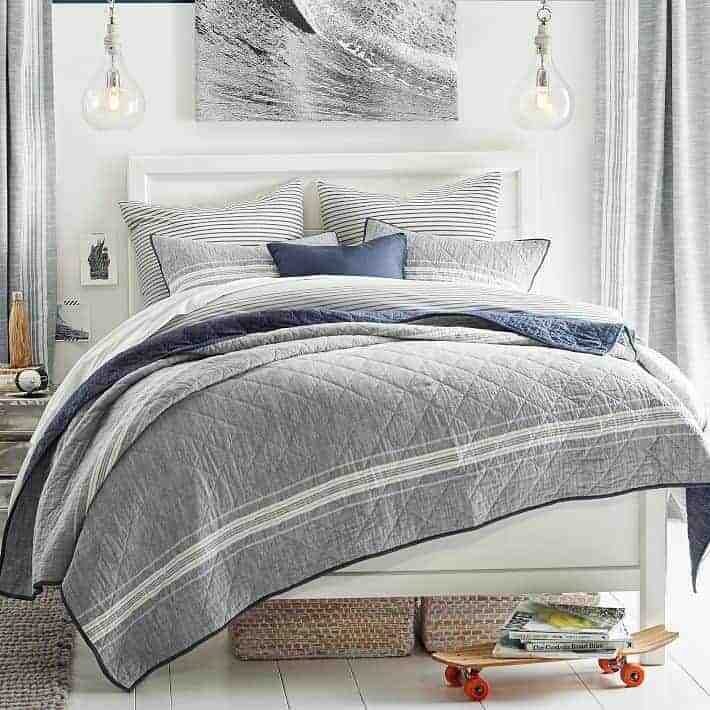 I was also able to find similar bedding at Target for much less than the original inspiration photos, although I may still splurge on a nice duvet cover. Overall, it feels like a design that will grow as he does. 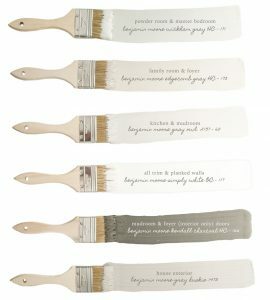 The base pieces are very neutral and will work just as well for a teen (or even adult!) as they will for a child. We will be putting the room together soon, so I will update you then! I absolutely love the ideas in this in this design.This is a room they could have for many years and as a mom of two boys, I love that. I think my favorites are the desk and dresser and I was surprised to see they were Ikea. I’m so glad you found it inspiring, Tristen! We have been so pleasantly surprised by the quality and style of IKEA. Do you have the link for the gray braided rug? Can you please tell me where you got this metal bed? Where did you get the gray desk? Hi, Leann! Here’s my affiliate link for the gray desk!